A 45 year old male presented with a 3 cm. testicular mass. Histology: The lesion consists of a fairly well-circumscribed but unencapsulated mass with intersecting bands of eosinophilic collagen. There is minimal entrapped seminiferous tubules seen at the periphery of the nodule. The surrounding interstitium shows normal Leydig cells. The tumor sheets out without tubular formation. 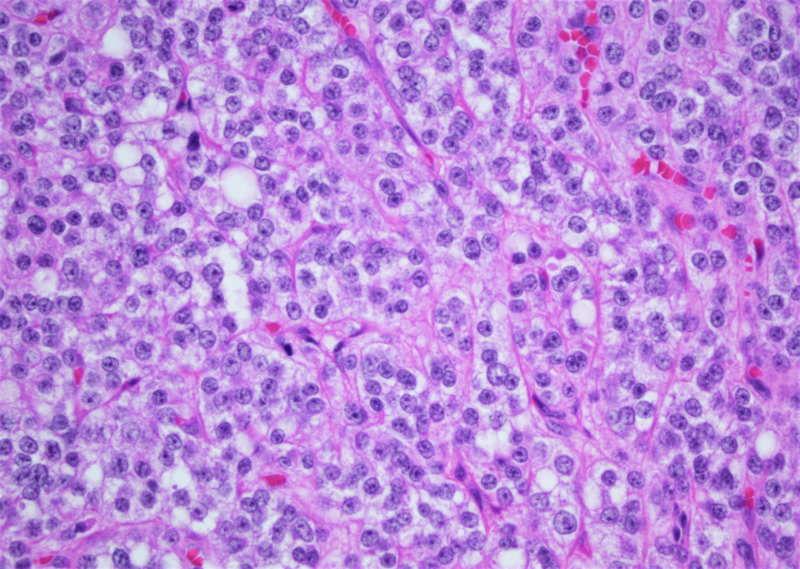 The neoplastic cells are polygonal in shape with fairly abundant lightly eosinophilic cytoplasm, which in areas at the edge of the tumor show vacuolization. Tumor cell nuclei are round with small but conspicuous nucleoli. Description: This case has some features that make it a not so straightforward to diagnose. 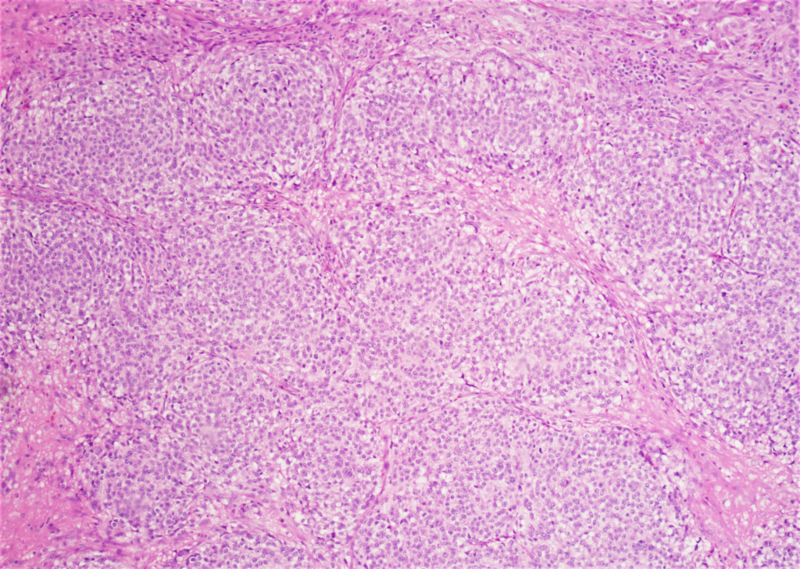 The presence of bands of eosinophilic collagen is more characteristic of a Sertoli cell tumor. Also the cytoplasm is not a bright eosinophilic as the normal Leydig cells in the surrounding testis. 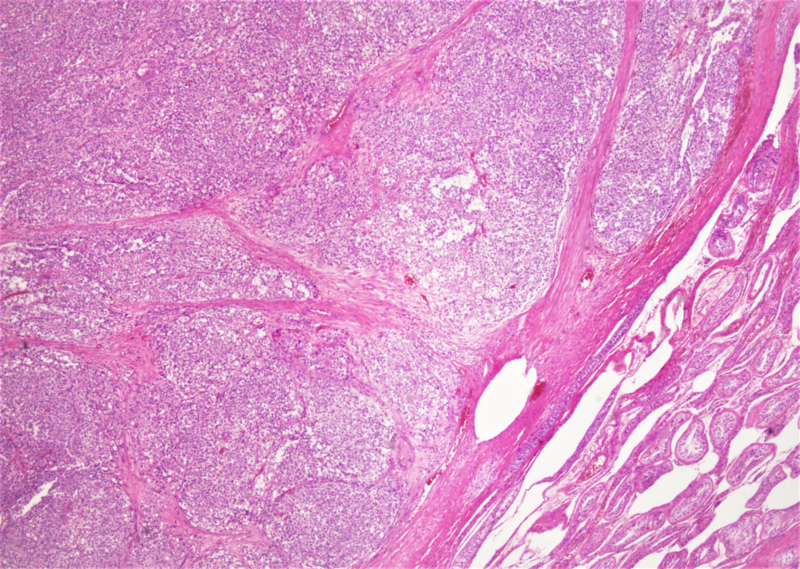 However, the sheeting out of tumor without tubule formation is typical of Leydig as opposed to Sertoli cell tumor. Also the presence of clear vacuoles containing lipid seen in steroid secreting Ctumor is characteristic of Leydig cell tumor. 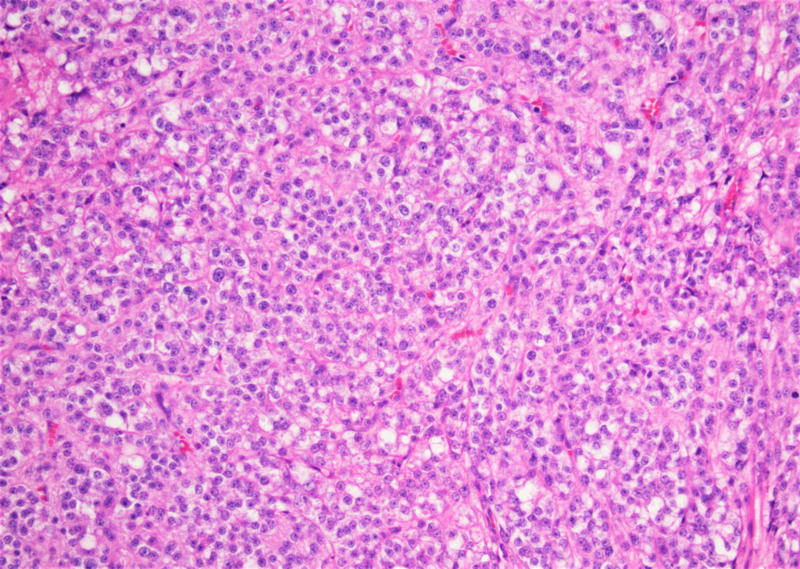 The tumor lacks any malignant features as it is small, lacks increased mitoses, lacks necrosis, does not widely infiltrate into the normal testis, and does have necrosis or pleomorphism. If one was not sure if the tumor was a sec cord stromal tumor, the best IHC markers would be SF-1 and if not available inhibin. In contrast to Leydig cell hyperplasia, the surrounding testis does not show multinodular collections of Leydig cells and with Leydig cell tumors the surrounding Leydig cells are either normal or decreased in quantity.